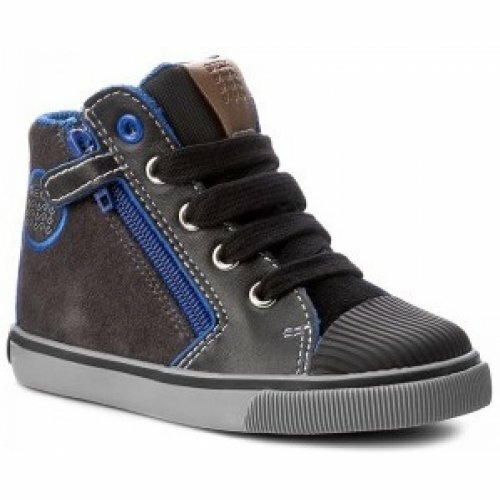 Geox Kiwi Boy is the perfect baseball style shoe for your child. This Geox shoe provides the mesh lining and a removable leather, open-cell insole, provide greater hygiene and practicality. The rubber sole is perforated and incorporates a special, micro-porous membrane that absorbs and expels sweat without letting water in. This also further increases breathability for the foot, which stays cool and dry all day. Optimal durability and grip are provided by the rubber sole and toe bumper. Whilst comfort and easy fit is provided with the velcro ankle for support, elastic lace detailing and zip up side. Available in blue multi, size 22 - 27 (UK 5.5 - 9).